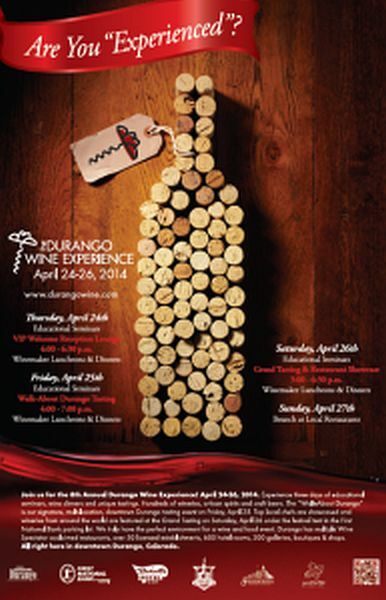 Join the 8th Annual Durango Wine Experience! Three days of educational seminars, wine dinners and unique tastings. Hundreds of wineries, artisan spirits and some craft beers. The “Walk-About Durango” is our signature, multi-location tasting event on Friday. Top local chefs and wineries from around the world are featured at the Grand Tasting on Saturday. We truly have the perfect environment for a wine event. Durango has multiple Wine Spectator acclaimed restaurants, over 50 licensed establishments, 600 Hotel Rooms, 200 galleries, boutiques & shops. All right Downtown Durango, Colorado. The ‘8th’ annual Durango Wine Experience will be held the beginning of May 2014! Learn More, Buy your tickets online now! Buy Durango Wine Experience Tickets!